Why did you choose to go native at your Fairfield property? Did you have a particular love for natives that you saw you could express at Fairfield or was it the other way around? 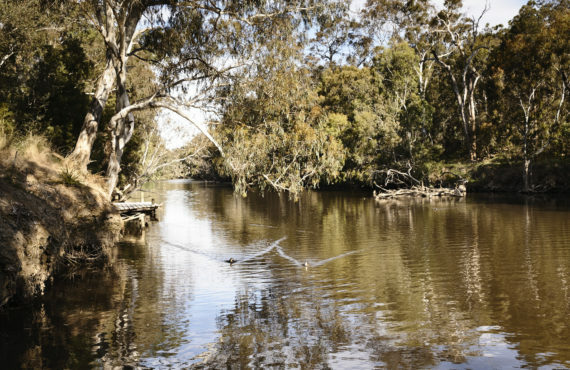 Fairfield is on the Yarra River (in inner city Melbourne) and we wanted it to feel like we were living on the bush. The whole point of being there at the house is its aspect, and we live better because of that site. We wanted to bring back the indigenous landscape – native is different to indigenous as lots of plants aren’t necessarily native to us locally but there are native to Australia – and down the bottom near the river we knew what we planted had to be tough and low-maintenance as we have no watering system on site. 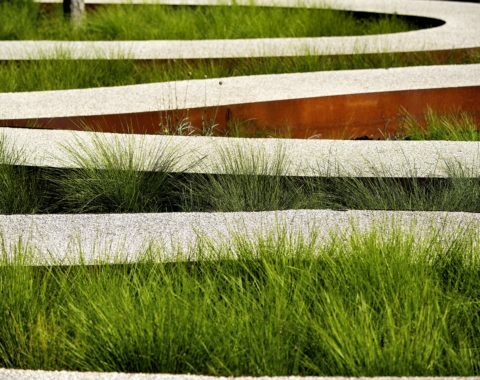 What were the design objectives for your garden? Design wise I wanted to make places to ‘be’ in so we knew what we wanted and where we wanted things to go. When we arrived there was an old car shell, a TV and a fox lair down there, so we had to remove a lot of rubbish. The objective was to be able to roll a wheelbarrow from the top to the bottom of site. One of the big things for us was bringing birds, frogs and wallabies back into the site. We get wattle birds with the grevilleas and there are probably a few too many ringtails now, but there is lots of activity which is the huge difference that using natives makes. We get a lot of enjoyment from what has come back. 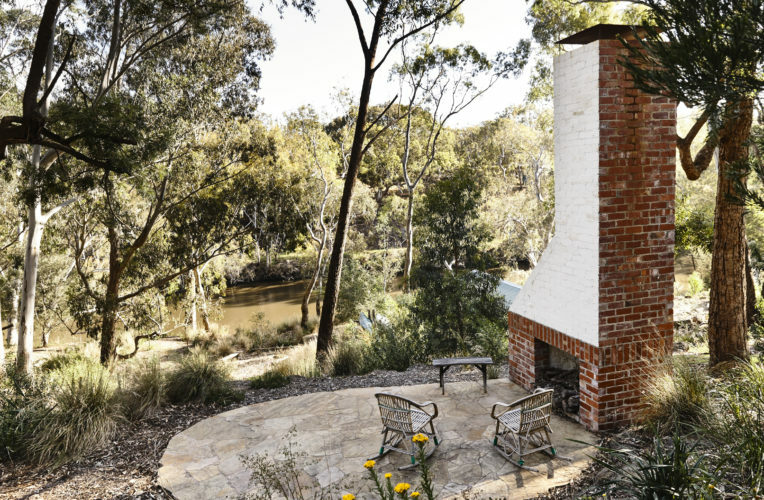 The key elements you designed into the garden are the deck, pool, the built fireplace, the campfire spot and the kayak jetty. Do you have a favourite section and what do you love about each one? We wanted a pool, and I liked the pure geometry of the circle. Even though it’s a natural pool we didn’t need it to be a natural shape. That shape was an experiment and a bit of a radical idea, which is hard for me to test with clients but we were prepared to have a crack at it as it didn’t have to be perfect. The circular geometry means it looks like a pond and from up above at the house it reflects the trees. Ducks and kookaburras come in, and the frogs get in at the frog-ladder as well. 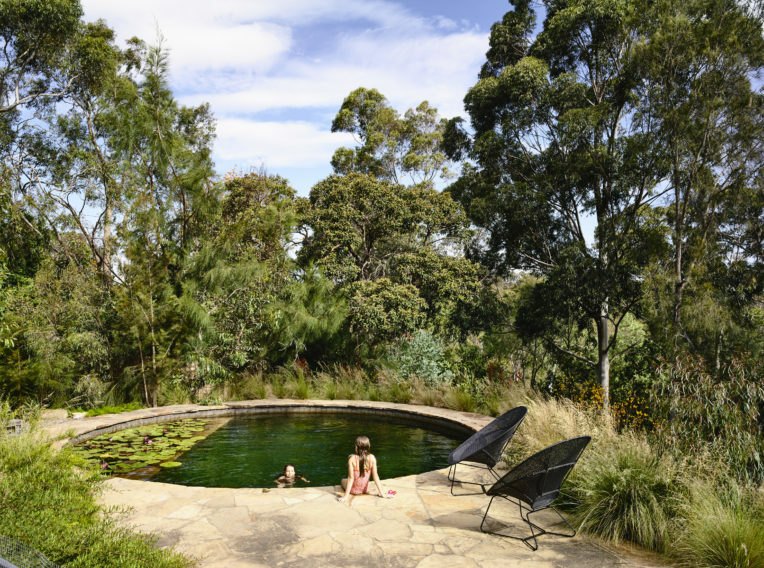 We worked with Wayne Zwar and Annika Kvist from Natural Swimming Pools. 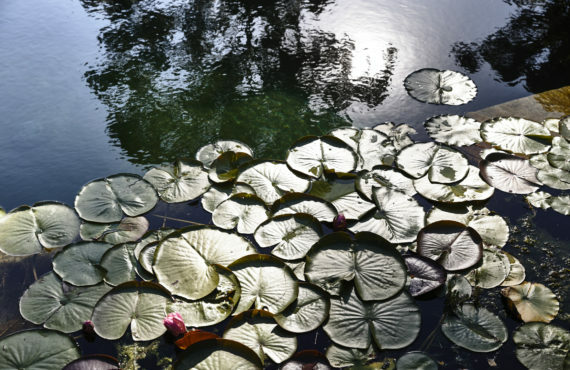 They use a European system where plants filter the water naturally, without chemicals. And we didn’t want a big bright blue shiny thing, so carefully chose tiles that were more natural and the palette sits in the bush perfectly. Then there’s the fireplace, which I designed off the chimney ruin that was already on the site. The campfire spot is right at the bottom, quite away from the house, so it’s somewhere we thought the kids would like to hang out as they get older. The deck is lovely. It’s so easy to sit out and enjoy the garden from there. It’s a long way to the bottom of the garden so most of the time we enjoy it from inside or on the deck while we’re working inside. Down the bottom we have boats and a jetty on the river that we share with our neighbour. It’s quite a long way from the house but it’s beautiful down the bottom, in the river valley. 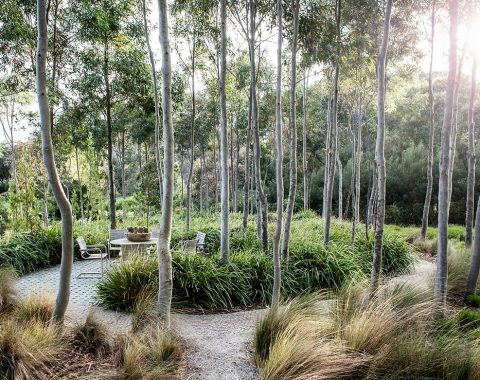 Why did choose to bring in landscaper Sam Cox and how did you collaborate on the garden design? It’s a south-facing, shady site, and hard to plant on a hill. We are used to doing our own gardening but we didn’t have the skills for that so worked with Sam Cox on the landscaping. We knew we didn’t want to build terraces or retaining walls, so Sam brought in an enormous amount of rocks to create paths and shortcuts through the garden. His plant knowledge is terrific. He has an inventory of plants that he uses to give form and create a natural landscape. Sam took care of the plant choices, planting and rock work and my partner and I designed the other elements. My partner had also planted a heap of plants before Sam came on board, which continue on now. He’ll just try things by chucking them in and letting them go. He’s put in lots of pretty, spectacular plants. 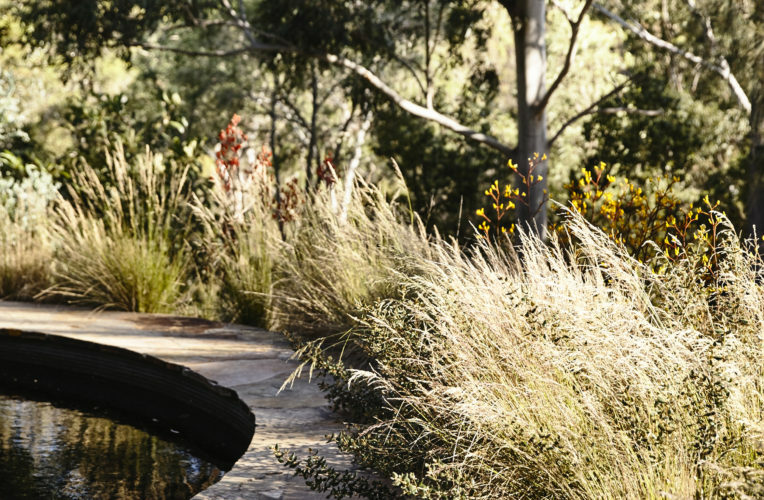 I often talk about having a ‘Margaret Preston garden’ full of waratahs, banksias, kangaroo paws, flowering gums and wattles – flowers that make for a beautiful bunch of flowers to give someone. How has it evolved and changed since you first planted the garden? 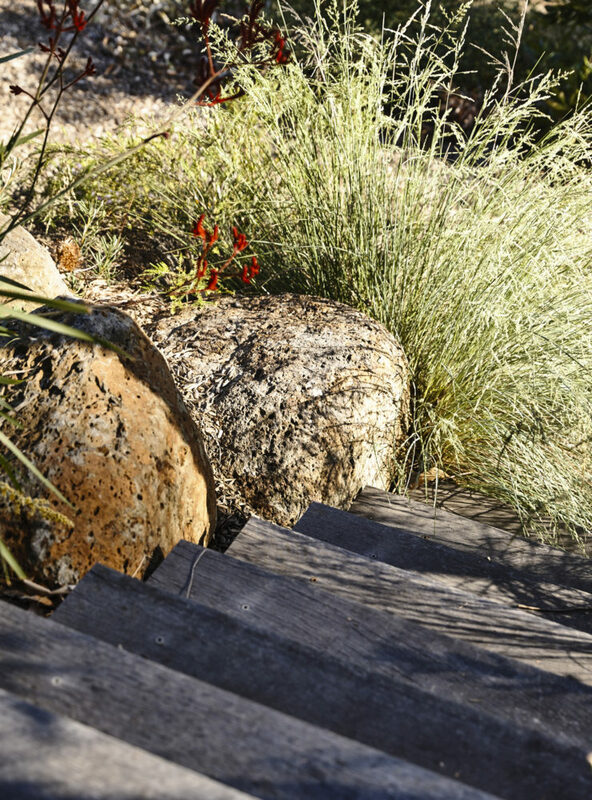 After the back of the house was landscaped, my partner and I later did an all-native garden at the front using dwarf gums. They look like a bonsai tree so they’re not too tall and don’t overshadow our solar panels. We also have edibles, some citrus down on the west boundary, oranges, limes, lemons and veggies down one side, veggie beds at the back, and picking trees down the side. We do have apricots and cherries in the bottom garden but they’re at war with the rats and bats so we have to net them if we want the fruit. We’ve also added lemon scented gums and like to consider what things smell like at certain times of year and after the rain. 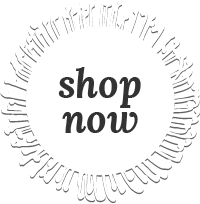 What or who are your go-to resources for info about natives beyond your personal experience? 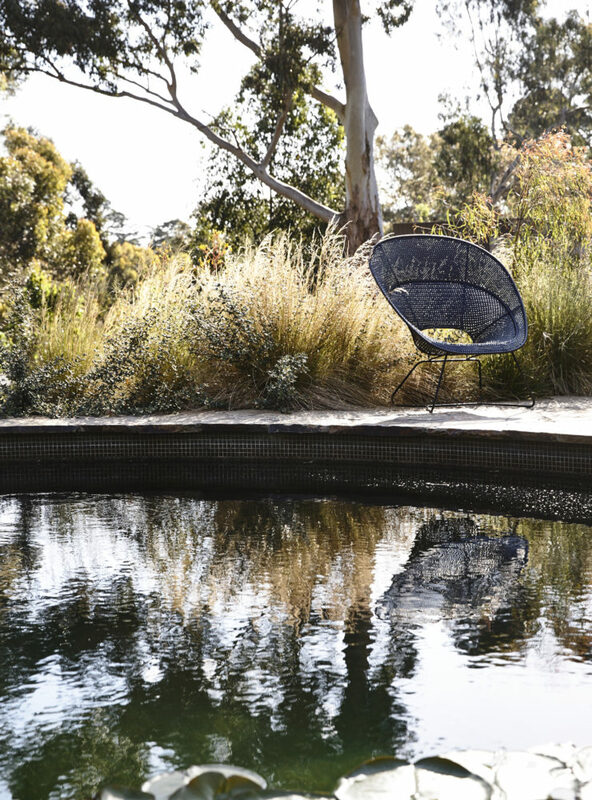 Cranbourne native garden is a great resource, as is asking your local florist or friends questions. Visit gardens, keep your eyes open, try things, find out if your local nursery can get something in. We used a lot of tube stock from Gro-Link, an indigenous nursery for the Yarra, for planting at the bottom of the garden, which meant it was truly indigenous to our area, and means we really don’t do that much apart from weeding down there. 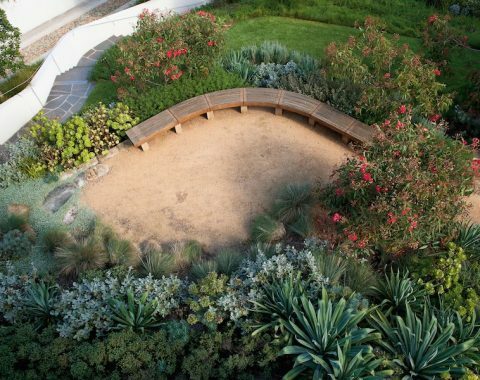 What would be your tips to someone who knows nothing about natives but would like to start a native garden in the city and might not have that much space? Be savvy about what is going to take room. My Dad would always say, ‘What does that little plant want to become?’ Read the label – is it a tree, a bush, grass? For example for the inner city, trees like the native frangipani don’t need that much space and give a great canopy, beautiful scent, and birds love them. Try and look at what is doing well in the area, and what space do they take up, whether they have leaf litter, whether you can grow underneath them and mainly look at what that little plant wants to be when it’s bigger.